1 vanity + 1 good idea = 2 nightstands - Lovely Etc. 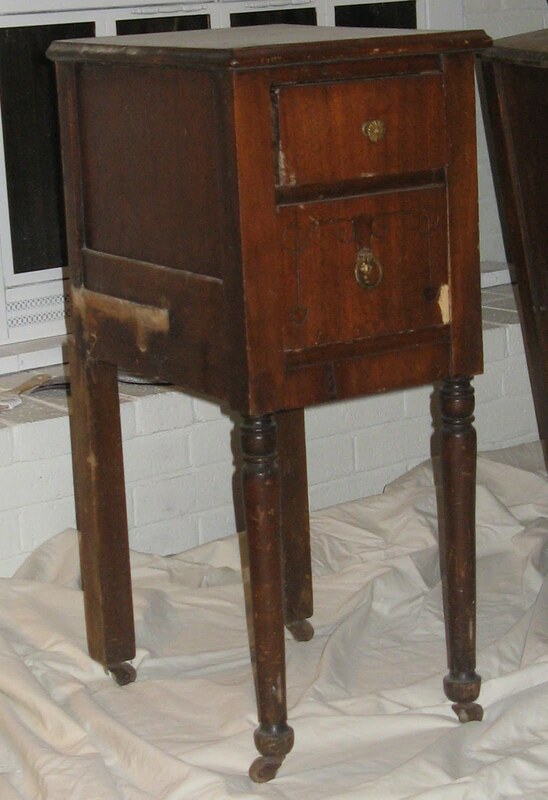 I picked up this rough looking vanity at a yard sale. The main mirror was missing, the wood looked terrible, and the drawers were full of dead stink-bugs. But I could see that at one time it had been quite sweet and I wanted to make it nice again. It sat in the basement for a while as I tried to figure out how to save it. I really didn’t need a vanity but I did need some very skinny nightstands. And this vanity was absolutely perfect. I figured I would need to cut the middle part away from the two sides but I was able to simply unscrew all the pieces and was left with two perfect nightstands. I decided to paint them a deep smoky gray blue color. I kept the original hardware but gave it a quick spray-paint and glaze treatment. If I were the furniture-naming sort, I would name them Ethel and Stella. They make me think of a pair of little old lady twins who still dress alike and go everywhere together. I absolutely love them. Plus they are perfect for our bedroom. We don’t have a lot of room next to the bed, so I haven’t had a nightstand on my side for the past three years. Now, thanks to these marvelously skinny little ladies, I have my own nightstand with my own lamp and my own drawers to junk up however I see fit. Ahh, life’s simple pleasures. What a terrific way to repurpose them! They look great. Love the way these turned out! Great job- love the color, too. It’s a spray paint? At first my heart sunk because it was such a beautiful piece…Then now, seeing how gorgeous they turned out, I have to say that I love that you were brave enough to do it! I love how you could have two of these change one to the night stands and have a matching bedroom set! Awesome work! wow!!!! what an awesome transformation!! 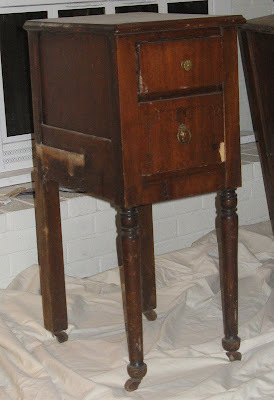 this would be such an awesome addition to my blog party from Trash to Treasure. I hope you’ll stop by and join in. OMG that is so creative!! I never thought of something like that, they turned out lovely!!! I’d love it if you would stop by my blog and share this at my link party! Great transformation,I love the color you used. I have done this with a vanity 2 times and loved it ! These look awesome! 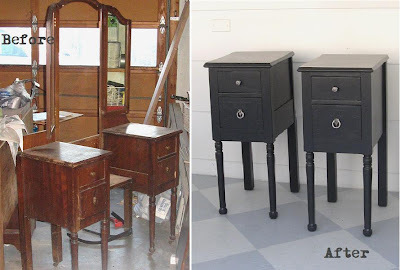 Can’t wait to see more of your furniture transformations! What a fantastic repurpose:) I love it! They look so great! What a great way to use the usable pieces! Thanks so much for linking it up! What a great idea – they look fabulous! Hello again! You will never guess what I found for only 35.00!!! Yes!! A an antique vanity!! I am seriously thinking about copying you. I am going to pick it up right now. I just had to tell you! I just acquired this same exact vanity. And same perdiciment– the mirror is missing. I had intended to move up the vanity shelf because it is ridiculously low, but I LOVE your transformation!! Now I know what to do! Thanks!! I have a set of these, already seperated for me, from my grandmother’s house. I had thought about doing exactly this and now I have even more desire to do this project in her memory! Thanks! Me too – I love when you can turn something you already have into something you love and need! I just picked up an antique vanity for $29 and am going to try this for the first time, super excited and a little intimidated. We’ll see, hopefully mine will be easy to take apart also!! Yours are beautiful! Thanks Kitty! I couldn’t believe how easy mine was – I hope yours is just as simple! Ethel and Stella turned out beautiful! Very clever of you to take them apart and make matching nightstands. Thanks Linda! I love how they turned out! How lucky that you discovered a way to take them apart! They look lovely now. I love those old 40’s-50’s vanity sets. Some of them are “Waterfall.” I couldn’t tell if that one was, but it’s a beautiful and practical makeover! Glad you found a way to use it. What will you do with the rest of it now? That’s a project for another day, I’m sure. I know – it was so easy! This one wasn’t a waterfall style, but I do like those too. I ended up donating the mirror for someone else to use. And I used the other random wood parts for some reclaimed wood projects. That’s such an awesome idea Carrie and they looks amazing.